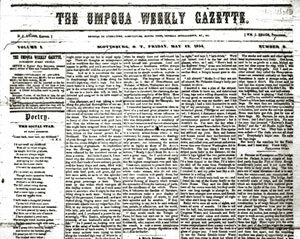 The first issue of the Umpqua Weekly Gazette appeared on April 28, 1854 in the small town of Scottsburg, about 20 miles east of Reedsport. The Gazette was only the eighth newspaper in the Oregon Territory, and the first south of Salem. Oregon City’s Flumgudgeon Gazette and Bumble Bee Budget, a handwritten satirical affair, was the first newspaper published in the Oregon Territory, in 1845. Two more Oregon City papers followed: the Oregon Spectator on February 5, 1846, and the Oregon Free Press in April of 1848. The first issue of The Oregon American and Evangelical Unionist was published near Hillsboro on June 7, 1848. The Western Star‘s first issue appeared on November 21, 1850 in Milwaukie (the paper was renamed the Oregon Weekly Times on June 5, 1851 after a move to Portland). The Oregonian appeared on December 4, 1850, and the Oregon Statesman was first published on March 28, 1851. In launching forth our little bark on the waves of public opinion, and unfurling our sheet to the breeze, we trust that one and all will come forward, and extend to us, not only kindness and lenity, but the necessary sup port requisite to keep our boat afloat and in proper trim. The prospectus of the Umpqua Weekly Gazette has al ready been extensively circulated, and all know the grounds we intend to occupy. Liberality and justice is our motto, and our columns shall remain free from the stain of political acrimony, or sectional abuse. We call particularly on the farmers to put their shoulders to the wheel, as the men who, in all civilized nations, make up the bone and sinew of society, and by their products furnish the nucleus, not only to the manu facturer, but to the commercial interests, of all lands. We will wind up this article, not with a promise of things we never intend to perform, but with the assurance to all of doing everything in our power to render our sheet both useful and agreeable. The paper stopped publishing in September, 1855.